The main navigation uses a nav element and is a good example of how nav doesn’t have to contain a ul or ol list of items. The video element is used although oddly the WebM video wouldn’t play in Firefox 11. The page charset definition could have made use of the new shorter code that HTML5 brings with it. Remember that the script and link stylesheet elements no longer require the type attribute. Looks like the link on this page is broken/missing something. It’s easy enough to figure out but thought I’d point it out regardless. What’s HTML5 here? All i see is the HTML5 doctype. I may be wrong in saying this, but I’m pretty sure that it is still considered to be HTML5 simply by using the doctype. At a glance, it doesn’t really seem to feature many new HTML5 tags or features aside from the doctype and , but it’s still HTML5. Semantics are so subjective to interpretation and I think that might be the point this developer was trying to make. While I do think the site is very nice, perhaps it is a poor example for someone who is trying to learn some things about the new HTML5 elements. It is a great website, but still, using just the doctype and nav doesn’t make it HTML5. Pretty much everyone uses the HTML5 doctype now but not all the website can be considered “HTML5 websites” for just that. You may be surprised how many companies still require HTML 4.01 doctypes and shockingly also use some new HTML5 elements. I just built a site for a client that had those exact (albeit conflicting) requests. I write code all the time and hardly ever use <canvas> or <figure> or <video> – does that mean my code isn’t HTML5? It doesn’t have to be all-inclusive. As far as the browser is concerned, if you are using an HTML5 doctype, it is HTML5. Validity of the code is another discussion, of course. The problem I think I have with this site being featured is the fact that it only seems to use doctype and <nav> – which as I’ve said before, isn’t really helpful for those who want to learn how to properly use some of the new tags. So regardless of who’s right – we both can agree that this site, as cool as it looks, probably shouldn’t be here. Unless Richard can explain to us maybe some other features that aren’t very apparent to us that are in use on this site. Hi, Richard didn’t add this to the gallery, I did. As has been mentioned above, the site uses the HTML5 doctype and the nav element. It also uses HTML5 video (which is mentioned in the description) on the “video” page. A site doesn’t need to use HTML5 markup everywhere to be featured here, I think it uses enough be featured on the site. It could be argued that some of the divs used could be replaced with sections, but the author obviously decided not to, which is also an ok thing to do. Thanks for the response, Ian. I made an assumption that it was Richard just because I’m unfamiliar with who’s running the site now. I agree with you – as I said in a previous post I think the author’s point was to show that semantics are very subjective to interpretation. You should note, however, that the links to this site are broken- most likely because it is missing “http://” and therefore thinks that it is on this server and not a different server. CSS3 is a part of HTML5 as well (http://www.w3.org/html/logo/) and my site features it heavily, so that also gave a reason for it to be shown here. Agreeing with Ian, I could make the divs into sections but it’s neither here nor there for the site to work as it was meant to. CSS3 is most defnitely NOT a part of HTML5, despite what that terribly misleading thing from the W3C may say. 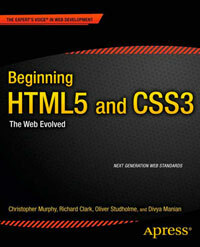 HTML5 is a specification, CSS3 is a separate specification. @Michael: Right – you could use CSS3 in HTML 2 with table-based layouts and it’s still HTML 2. HTML5 has become such a buzzword that even some developers have a hard time separating its features from previous iterations. And like Ian said, it doesn’t help that W3C is publishing misleading content like that.